Kuranda Envirocare has prepared maps of the Kuranda area in Far North Queensland, Australia, showing the Envirolink, Fairyland and Barron River biodiversity corridors, all in relation to the Wet Tropics World Heritage Area. 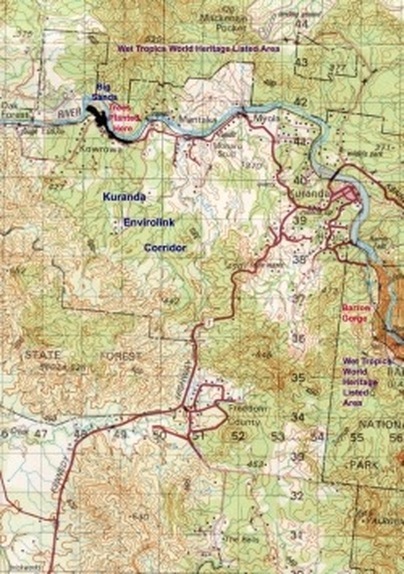 Referring to the map on this page, the Kuranda Envirolink Corridor is of strategic importance due to the link it creates between the rainforested areas to the north and south of Kuranda. The Wet Tropics World Heritage listed rainforest is home to thousands of plant and animal species. The Barron River Gorge is a natural divide cutting across the narrowest neck of this protected rainforest habitat. Before human settlement, the rainforest links at either end of the gorge allowed the free movement of fauna species around this natural barrier. With the growth of the city of Cairns right into the mouth of the gorge, and the development of the Kuranda area at the top of the Barron Falls, above the gorge, this connectivity has been lost. The arc of remnant rainforest vegetation to the south and west of Kuranda is the last real link around the gorge, and most of it is on private property. It is important that this vegetated link is retained and augmented, so that animals such as the Cassowary, one of the world’s largest birds, can continue to move through the Kuranda area, maintaining the genetic diversity of this already threatened species. The Cassowary is a fruit eater, and it is largely responsible for the propagation of a large number of rainforest plant species. Lose the Cassowary, and many species will go into decline. Kuranda Envirocare is working to revegetate the degraded areas along the Barron River to form a connected link between the Kuranda Envirolink and the Fairyland corridors, where the railway and previous farming ventures have most damaged the corridor. Thousands of trees have already been planted and each year more of this area is reclaimed.